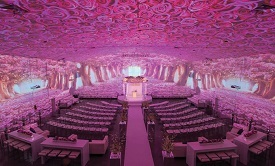 Projection mapping adds a layer of dimension to events that you just can’t get from mounds of decor. Projection mapping is the integration of projectors and computer software to project still or video images onto any surface, whether it be a table, wall, ceiling or building. Alissa Hurley, CMM, DES, CED and vice-president of marketing at FMAV, based in Ottawa, says projection mapping can go on pretty much any surface, from flat wall to wooden or fabric inlays—what you would find in almost any convention centre across the country. “In fact, mapping can take advantage of those different surfaces to create dimension,” she says. The scope of the technology is practically limitless. Costs vary for projection mapping, depending on the duration, complexity of the program and the type of graphics desired. The complexity arises with the prep work. The operator has to work with the software to map the surface where the images will be displayed.